Long before the age of the submarine, Frenchman Jules Verne conceived the idea of a vessel that could move about in the depths of the ocean. Around this idea he wrote the famous story "20,000 Leagues Under the Sea", which tells of the submersible steel monster Nautilus and its eccentric inventor and master Captain Nemo. This strange and somewhat sinister craft has now been produced by Airfix. The kit has a completed length of 275mm and its futuristic shape fires the imagination as the book has done for decades. 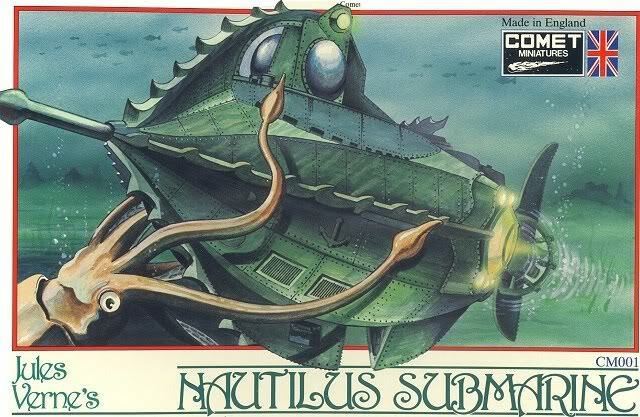 Pictured is the second edition box art from Comet Minatures.